"In the 6th (Forest Law) of Edward the First (King of England, 1272-1307) it was ordained, if any mastiff be found on any deer, the same mastiff being expeditated (i.e. made lame), then the owner shall be quit of that deed...the mastiff in those ages was a very different animal from the massive creature of later times." 'Researches into the History of the British Dog' by George Jesse, 1866. "In the very specialised circumstances of the Tudor animal fight, the mastiff was really very much at a disadvantage. It had never been bred, originally, as an animal-fighting dog at all. It was a hunting dog." 'The British Dog' by Carson Ritchie, Robert Hale, 1981. More than any other group of dogs, the mastiff group has long been misused by man - directly in the baiting rings and combat arenas and indirectly, both in the barbaric medieval hunting fields and, in a gentler way but as threatening to their well-being, in the false glamour of the modern show ring. For such brave, determined, admirable dogs to be so misused is undeserved and unjust. At man's behest, such dogs sacrificed themselves in the big game hunt, initially to provide food, then to provide sport. In many boar hunts in the Middle Ages, more dogs died than boars. Whether called beissers or bandogges, holding dogs like filas or presas, saufangers or seizers, catch-dogs or Ca de Bou, leibhunden or bull-lurchers, this type of dog has suffered at the hand of man. They may have lost their original role but must soon be recognised for what they are: the most impressive form of hunting mastiff or heavy hound imaginable. They thoroughly deserve to be bred as powerful athletic hounds and never as overweight, badly-constructed yard-dogs, valued purely for their sheer size and bulk. We should be immensely proud of their heritage and breed them to honour it. The Hound Group, as recognised by the Kennel Club of England, embraces a distinguished and extremely varied collection of breeds of dog. 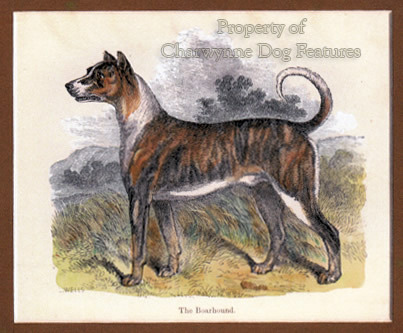 The scenthounds are well represented, from the lugubrious Bloodhound to the lively Beagle, with more foreign breeds like the Basset Fauve de Bretagne, the Petit Basset Griffon Vendeen and the Hamiltonstovare, entering the list with each decade. The sighthounds also feature strongly, from the aristocratic Afghan Hound to the once humble Whippet. The Group even includes a breed that works to the gun, the Finnish Spitz, and a breed better classified as a terrier, the Dachshund. But, as I have argued throughout this site, there is a serious omission in this Group, that of the heavy hounds, sometimes called the hunting mastiffs. The omission of the Great Dane, as argued in more detail earlier, once a renowned boarhound, from the Hound Group has long been not just a significant loss from the group but also a threat to the credibility of the group system itself. That omission is however much more understandable when related to the omission of the hunting mastiffs altogether. Why should wolfhounds feature in this group but not boarhounds and the heavy hounds once used to hunt other big game, such as wild bulls, buffalo, bears and even wild asses? I suspect that one reason is the influence that Victorian writers on dogs had on the emerging Kennel Club. The former offer us fascinating reading material and provide quaint quotes but their scholarship, particularly any objective corroborated research, is sadly lacking. Regrettably, such sources are always the first resort of the eager breed historian or the overnight dog expert. A fair general summary might be that the Victorian writers on dogs were all too often gundog enthusiasts only too willing to portray other breeds in their contemporary rather than their historic setting. From such a background, the mastiff type became embraced by the Working Group and a breed like the Bulldog, so much a sporting dog in previous centuries, became a Utility Group breed, a description even sounding disparaging. Small wonder that this splendid breed developed more and more into an unathletic exaggeration of its former sporting self. We may thankfully not actually want our Bulldogs to bait bulls nowadays, but, to be true to their origins they should be physically capable of doing so. Most of their breed historians strangely overlook their much more valuable and ancient role as bull-pinners or butchers' aides, adapted to a shameful sport by mainly town-dwelling blood-sports enthusiasts. Our Staghounds don't hunt stags any more but are bred to a proven design to permit this. Our Borzois don't hunt wolves anymore but they retain the physical ability to do so - and expect to be judged as hounds born to run. The Bulldog seems to be judged mainly on its head. Unfortunately the FCI too has got itself into a considerable muddle over the heavy hound breeds it recognises and Britain does not. The Fila Brasileiro and the Dogo Argentino, both still used as heavy hounds in their native countries, are not classified as hounds but collected together with a real hotch-potch of breeds including what they dub the Molossers, mainly the broad-mouthed breeds. Even overlooking the fact that the Molossian dog took two forms, a big flock guardian and, separately, a huge hound, and did not include the broad-mouthed breeds, such a grouping wrongly transplants the descendants of the heavy hounds into the guarding breeds. This betrays their rich heritage and seriously misleads breeders and judges of such admirable dogs. Group 2 under the FCI system includes Pinschers, Schnauzers, 'Molossian Type' and Swiss Cattle Dogs. In other words, terriers from Germany, hunting dogs from South America, a boarhound from Germany, flock guardians from the Pyrenees and the Caucasus, the mastiff breeds of Europe, the Bulldog and a water-dog from Canada, the Newfoundland, are considered to have some sort of collective bond or rational congregation. Scent-hounds are in Group 6. This means that scent-hounds like the Grand Bleu de Gascogne, the Grand Gascon-Saintongeois, the Anglo-Francais Blanc et Noir and the Francais Tricolore, all around 0.65m high are candidates for Group 6. But hounds from South America of that size are not. The Fila Brasileiro was developed from a number of breeds including the Bloodhound and the Great Dane, but is assessed by the FCI to be not a hound but purely a guarding breed. Our Kennel Club puts the Bloodhound in the Hound Group, the Great Dane in the Working Group and the Bulldog in the Utility Group. There is some very muddled thinking going on here and it can't produce judges with the desired experience or knowledge in the right rings. Of course the loss of function once the hunting of big game with hounds lapsed led to the disappearance of many types of heavy hound: the Bullenbeisser in Germany, the Mendelan, a huge bearhound, in Russia and the Suliot Dog in Macedonia/Greece, for example. The huge staghounds of Devon and Somerset, disbanded early in the last century, were twenty seven inches (0.68m) high and described by Dr. Charles Palk Collyns in his 'The Chase of the Wild Red Deer' as "A nobler pack of hounds no man ever saw. They had been in the country for years, and had been bred with the utmost care for the express purpose of stag-hunting...their great size enabled them to cross the long heather and rough, sedgy pasturage of the forest without effort or difficulty." Sir Walter Scott, in 'Woodstock', produces an interesting description with his words on 'Bevis': "It was a large wolf-dog, in strength a Mastiff, in form and almost in fleetness a Greyhound. Bevis was the noblest of the kind which ever pulled down a stag, tawny-coloured like a lion, with a black muzzle and feet." That, at the start of the 19th century in Britain, is a good description of the alauntes or hunting mastiffs of Gaston de Foix four hundred years earlier. Topsell, writing in 1607, stated that: "There be in France, dogs brought out of Great Britain to kill bears, wolves, and wild boars", describing such dogs as "singularly swift and strong." We have clearly lost a distinctive type of heavy hound. Denmark has also lost hound breeds, the Augustenborg Hunter and the Strelluf Hound, for example, but has saved the Broholmer, an ancient type of hunting mastiff. The word 'mastiff', now utilised precisely to describe a specific British breed of pedigree dog, has long been used, and misused, by scholars to describe huge fierce dogs of all types. 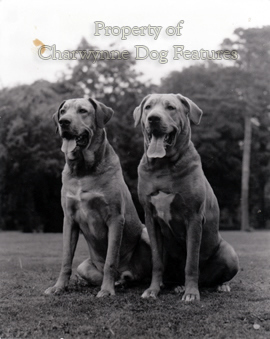 This has allowed researchers in the breed of Mastiff to indulge in all kinds of whimsical thinking, as Adcock, Taunton, Kingdon and MacDona demonstrated a century ago. In his valuable book 'Hunting and Hunting Reserves in Medieval Scotland', John Gilbert writes of references to mastiffs in the Scottish Forest Laws; capable of attacking and pulling down deer, they wore spiked collars and were used to attack wolves and hunt boar, when they hunted to the horn. 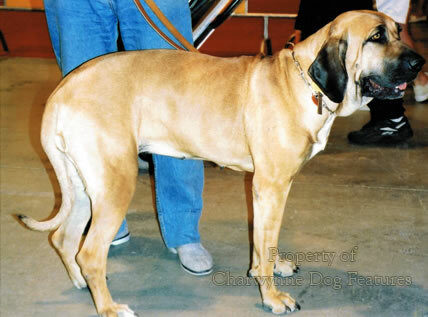 Gilbert was referring to a heavy hound not what is now the modern breed of Mastiff, whose appearance and especially its movement is scarcely hound-like. This makes a point for me. Directly you stop breeding a dog to a known function, even one long lapsed, then the breed that dog belongs to loses its way. 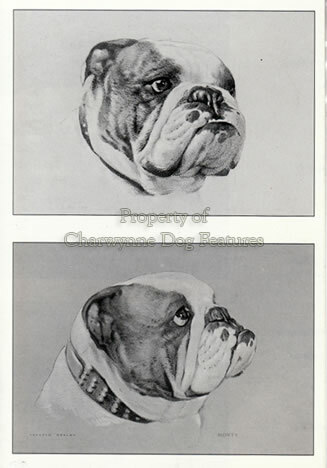 We saw this in the Bulldog and now see it increasingly in the broad-mouthed dogs, worryingly too short in the muzzle and progressively less athletic. Their fanciers forget the sporting origins of their breed, foolishly to my mind, and pursue obsessions with heads, bone and bulk. This is not only historically incorrect but never to the benefit of the dog. The heavy hounds were highly rated in the ancient world, from China to Assyria and throughout Europe. 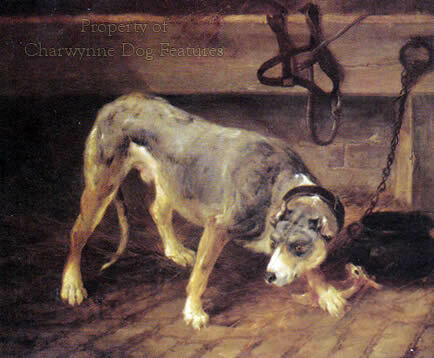 Their function may have been overtaken by the invention of firearms and the march of time, but those which survive should not be insulted by being bred as unathletic yard-dogs, described as 'Utility' breeds and removed from the sporting division, to be lumped with the herding breeds or sled-dogs. The Hound Group both in the FCI and the Kennel Club interpretation urgently needs a truly radical rethink. Showing dogs may be rooted in appearance ahead of performance but the function any breed was developed for must have the primary influence on its design, its anatomy and its physical capability. Judging dogs on their appearance without regard for their purpose gives scope to the faddists, permits exaggeration and allows the less well-informed fanciers to get lost and misled. The dawning of a new millennium allows us to benefit from a faster pace of scientific progress, a more enlightened attitude to subject creatures and greater respect for heritage. This must gradually restore common sense to the breeding of famous breeds based on a new respect for their immense service to primitive man in his ceaseless struggle for survival. This can only lead to a revival of interest in what breeds were bred for. The functional ability of breeds has to be re-emphasized. The reverence allotted to pedigree needs to be questioned; blindly repeating the immediate past, whilst overlooking what went before is not honest.